I was craving for something savoury last week. Chwee Kueh came to mind but I was just too lazy to either drive to our popular haunt to buy or even to prepare it myself. Then I started to crave for Otah. Yes, this is manageable as I got hubby to drive me to Jln Kayu (the parking there is a nightmare these days). After trying so many manufacturers, this one is still our favourite. I am beginning to think that this snack will be the best way to train my little girl in eating spicy food. With Otah Bun in mind with the remaining sticks, I went on to look for a straight forward bread recipe. Too impatient to wait for double the proofing time thus this straight dough method will be the most ideal. I have got this book for years but never really attempt on any of it. So perfect opportunity now. 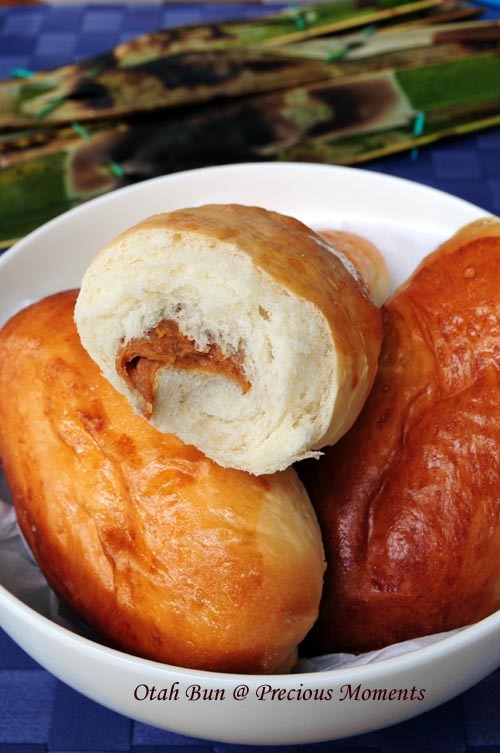 A little crazy to have Otah bread for breakfast as it is a little hard on the stomache in the early morning but what the heck, life is short. Combine A thoroughly and add in B. Knead till full incorporated. Add C and knead till elastic. Proof for 45 min or double in volume. Punch down and weight approx 60g of dough. Wrap the otah and let it proof for 10 mins. Charmaine I am not sure how otah fillings can oozed out. Basically just ensure that you pinched the dough round the otah well.